BOAT CAN BE PURCHASED FOR $39,999 WITHOUT FISHING PERMITS! This is your opportunity to purchase an active Sportfish Charter boat with Federal Licenses including the Pelagics 6 Pack and Reef Fish. 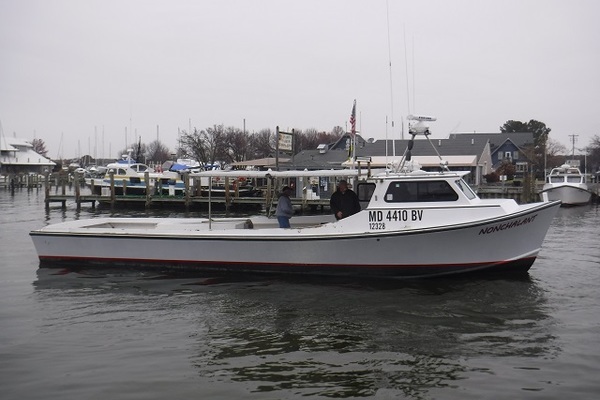 This 1988 35 Resmondo Sportfish has recently had the bottom painted and running gear/props cleaned and balanced, ready for the upcoming fishing season in the Upper Gulf Coast. Current and Prime Boat Slip is available to new owners. Powered by twin Cummins 6BT 5.9 engines and a 9Kw genset along with A/C you and your guests can fish and cruise in comfort while you bring in the big catch (See Large Transom Door). Don’t miss out this great business opportunity. United Yacht Sales Emerald Coast would love to guide you through a personal showing of this 35' Resmondo Convertible 35FT 1988. 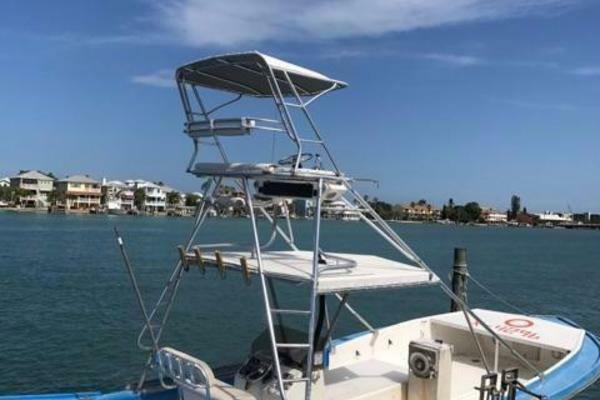 This yacht for sale is located in Pensacola, Florida and priced at $59,999. For a showing please contact us by filling out the form on this page and we will get back to you shortly! Entry to the vessel interior is by way of a hinged wooden door located center aft in the salon and is on the same level as the cockpit. The interior décor consists of Formica, wood, carpeting, upholstery and glass. The head is located down to starboard and contains a stainless steel sink and Jabsco manual operation toilet. The head is plumbed thru a wye valve to a six gallon plastic holding tank that can be pumped out a dockside or emptied in legal waters. A reported 60 gallons of potable water is carried onboard in two plastic cylindrical tanks under the Vee berths and is pressurized at the user components. The layout of the hull consists of peak void space forward thru the anchor rode, aft of which are V-berths port and starboard on the same level with storage spaces under. Aft of the V-berths on the starboard side is the galley and then the head compartment. Aft of the V-berths on the port side is the dinette area with table centered by fore and aft bench seating. Four steps up lead to the salon sole. To starboard is the helm, aft of this is a pedestal helm seat and then wooden shelf cabinetry and roof mounted TV. To port is a cushioned bench style seating arrangement with storage space for life jackets under. Out the entryway door aft is the cockpit sole which is open for fishing or entertaining purposes. The fiberglass sole is normally covered with interlocked plastic squares that can ease the stresses caused by the dropping of heavy gear or dive tanks. A welded aluminum taff railing around the cockpit coamings affords protection for the crew and guests. A transom door is center in the transom and opens to allow boarding of the large game fish often caught on these type vessels. The salon is mounted midships and has large windows for good visibility. Metal handrails atop the cabin top are provided for safety of those on deck. Atop the salon hard top is the radar scanner, a Coleman roof top 14,500 BTU air conditioner, a KVH Tracvision DV3 TV system and the aft navigational light. This vessel also has an aluminum tower with upper helm and upper electronics console. A wide bench type seat is available for the upper helm captain and/or crew. The superstructure of this vessel has a profile typical of the charter boats that ply the waters in this area and is constructed of fiberglass covered plywood. The hull is planked with plywood of an unknown thickness and the exterior covered with an overlay of fiberglass. Strengthening of the hull is achieved with three bulkheads of plywood mechanically attached to the framing and other cabinetry that is secured onto the hull. Additional strengthening is provided by four 5-1/2” X 5-1/2” longitudinal stringers that are used as engine beds and a 4” thick wooden keel in the center. The weather deck is constructed of Juniper framing, properly crowned to shed the water, and has an overlay of fiberglass to help withstand the rigors of the day-to-day use of the vessel. Non-slip is applied on most all deck surfaces. There is a 14” galvanized cleat center forward with port and starboard metal chocks forward, 7” metal spring line cleats are port and starboard midship, and 10” metal cleats are port and starboard aft for securing the vessel. A stem head roller mounted in a pulpit that extends forward over the bow stem assists in hauling the anchor and rode. There is a tall welded aluminum safety railing from the bow to approximately one-half way to the stern and this railing has two life line type welded pipes between the top and the deck for additional safety of those on deck. A single hatch is on the foredeck for ventilation or emergency exit purposes. One aluminum water-tight hatch is in the cockpit sole to access the components below deck. The large self-bailing cockpit located aft is wide and open for fishing or entertaining purposes. A welded aluminum safety railing extends around the cockpit for additional safety for the guests in that area. Boarding gates are port and starboard plus a transom door is center aft to allow the capture of the large sportfish often caught by these type vessels. Ventilation for the mechanical components is available thru openings on the underside of the cockpit coamings. The interior of the vessel can be vented naturally by the cabintop hatch and the companionway. The interior climate can be controlled by a Coleman Roof Top air conditioner of 14,500 BTU capacity or a MarineAire 16,000 BTU unit mounted under the dinette seating that has reverse cycle heating capabilities. Meets U.S.C.G. Standards with side lights on the sides of the salon, a pole mounted top all-round white light is mounted on the underside of the upper helm console box and an aft white light is mounted of the aft portion of the cabins hard top. Steering from the helms is by Hynautic hydraulic systems plumbed combo directly to the slave cylinder attached to the rudder tiller crossbar. Powered by twin Cummins 6BT 5.9 @ 210HP. Both engines recently had the cylinder heads changed out with new units over 1 year ago. These engines are mounted atop the engine stringers on vibration absorbing flex mounts. These freshwater heat exchanger cooled engines are located beneath the salon sole with access by way of hatches directly over the engines or a half door forward with access from the galley. The power created by these engines is transmitted thru Hurth hydraulic marine gears which turn the 1-3/4” stainless steel shafts thru dripless self-aligning shaft logs to power the 22” x 20” three bladed propellers. The engines are controlled at the helms by Morse twin lever units, transmitting movements to the engine components by way of push-pull cables. Gull instrumentation is found at the lower helm to monitor engine conditions while underway and the upper helm has oil pressure, temperature and RPM gauges installed and available. The exhaust system consists of metal, marine engine exhaust hose, fire retardant inline fiberglass mufflers, and exits out the transom port and starboard. The generator set is a MassPower 9 KW unit. It’s driven by a diesel engine and is located forward center in the engine compartment. The engine exhaust is routed thru an uplift muffler before it exits the hull. Diesel from one painted aluminum rectangular tank located under the cockpit sole. The capacity is reported to be 328 gallons. This tank is secured, bonded, vented and have marked cut-off valves plus an emergency cut-off method accessible from the salon sole. All fuel lines are copper and flexible hose with primary and secondary fuel filters located near/on the engines. The generator set has a Racor 500 series fuel filter and the main engines have Racor 900 series fuel filters plus the engine mounted cartridge filters. The fuel fill is on deck where any spillage would drain overboard or run out the vent fittings. 12 volt DC is supplied by four 4D batteries and one #24 series battery. Fused switch panels are also found at the helm. Onboard AC power is provided by the 9 KW diesel engine driven generator set. 30 amp shore power is supplied to the vessel by one approved shore power cord and twist lock receptacle located to port in the cockpit.